In July 2012, the 900 acre site received approval for between 90 and 100 residential units and preserved 635 acres of forest land. The Pebble Beach Company wanted to pay in-lieu fees for the mandated inclusionary housing rather than build the units themselves, but because of LandWatch’s involvement the inclusionary housing will be built nearby. The Golf Course project included upgrades to the irrigation system and the removal of 533 trees. The project applicant is the Pebble Beach Company.The project would build 90-100 residential units and protect 635 acres of forest land. The Golf Course project would upgrade current irrigation systems and remove 533 trees. The project is governed by the 2010 Monterey County General Plan. The Planning Commission, at its May 30, 2012 meeting, recommended that all affordable housing units be built onsite, instead of accepting in lieu fees for the units, unless an alternative site is found on the peninsula. 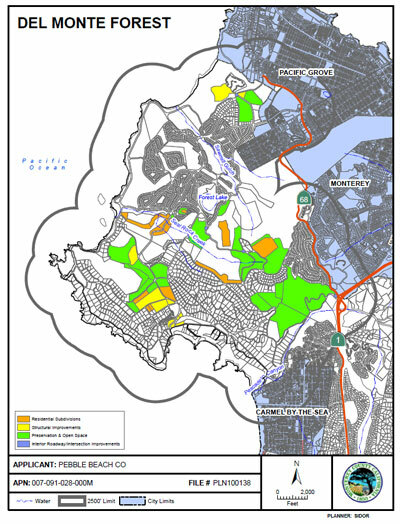 This map shows the Pebble Beach/Del Monte Forest project. The Pebble Beach Company wants to pay in-lieu fees for the mandated affordable housing rather than build the units themselves. The County admits the fees may never actually build anything and affordable housing on the Peninsula is in great demand.